If you like making lots of bets, handling lots of chips and cheering with a table full of winning players, roulette is a game you’ve got to try. The house edge is low, about 2.7 per cent in a single-zero game, and overall it’s a really simple game to learn. That said, there are some key points you need to get familiar with to have the most fun and to give yourself the best chances of leaving the table a winner. In this article we’ll explain how to play roulette, the rules, how all the different bets work and how much they pay out, as well as a few handy betting systems you can use to help control the outcome of your sessions. If you’re playing roulette in a live casino the first thing you have to do is buy special chips from the dealer. Unlike other casino games that use standard casino chips, roulette has special colour-coded chips so the dealer can keep track of which bets belong to which player. Depending on the stakes, the roulette chips might have different denominations but if you’re playing a regular low-stakes game, they’re usually $1. This is great because you get to play with stacks of chips and make lots of different bets, even if you’re not a high roller. One important thing to remember is that not all roulette tables are the same. 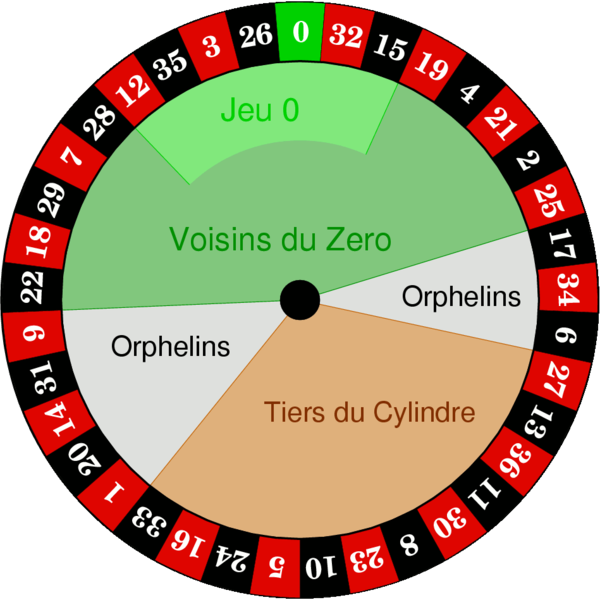 In addition to the 36 numbers, European Roulette tables have just one zero while American Roulette has both a single-zero and double-zero. Despite the names, both versions are available in casinos all over the world. Always look for the single-zero games when you’re new to roulette and focused on making an easy and quick profit. The house edge is 2.7 per cent. That’s half the house edge compared to the version with zero and double-zero. When picking a single-zero you take away one likely propabilty of losing your sweet earned money. When you first get to the table, whether it’s a live casino or software driven casino table, you might have to wait for the current spin to finish before you can make your bets. When the ball is in the wheel you’ll see the dealer wave his or her hands over the table to indicate that no more bets will be taken for that spin. Once the current spin has finished and the dealer has paid out all winning bets and collected all the losing bets, the table is clear for you to place your bets. Most tables have minimum bets for “inside” bets and “outside” bets. 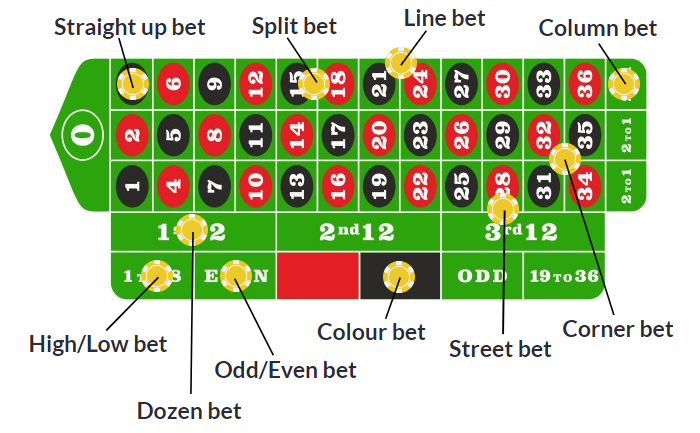 Inside bets refer to any of the individual numbers, corners, streets and intersections. If you’re not familiar with those terms, don’t worry. We’ll explain them in detail in the next section. Outside bets refer to black or red, odd or even, low bet (1-18) and high bet (19-36), columns and dozens, basically all the betting options positioned around the outside of the table layout. There’s one more important thing to understand about minimum bets in roulette. If the minimum bets for the inside and outside are $10, for example, that means each individual bet on the outside must be $10 minimum. For the inside bets, however, it’s TOTAL of all your inside bets that must be a minimum of $10. Now let’s take a closer look at all the different betting options available when you’re playing roulette. We’ll go over them quicky and provide you with a winning strategy for beginning players. Spreading your chances is key in roulette but of course you need to know what options you have. The classic winning roulette moment is all about betting a single number, hitting it and winning 35 to 1 on your bet but there are tons of other bets you can make on the roulette table. Straight Up Bet – A bet on a single number. It’s both the least-likely to hit and the highest-payout bet on the table. Straight up bets pay out 35 to 1. Split Bet – A bet on the line separating two numbers. This splits your bet between the two numbers and pays out 14 to 1. Street Bet – A bet placed on the line at the end of three numbers (for example 1,2 and 3). Street bets pay out 11 to 1. Line Bet – A bet on two streets (six numbers), placed on the intersection of two streets. Line bets pay out 5 to 1. Corner Bet – Sometimes called a square bet, a corner bet is placed on the intersection between four numbers. Corner bets pay out 8 to 1. Five Number Bet – This bet is only possible on American roulette tables (the version with both a zero and double-zero). It’s placed on the line separating the 0 and 00 from 1, 2 and 3 and covers all five numbers. It pays out 6 to 1. Red and Black – A bet placed on whether the number will be red or black. Winning red and black bets pay out 1 to 1 but if the ball lands on zero or double-zero, red and black bets both lose. Odd and Even – A bet placed on whether the number will be odd or even. Winning odd and even bets pay 1 to 1 but similarly to red and black, all bets lose if the ball lands on zero or double-zero. 1-18 and 19-36 – A bet placed on whether the number will be in the low or high halves of the board. These bets also pays out 1 to 1 and lose if the ball lands on zero or double-zero. Column Bet – A bet on 12 numbers placed on one of the three vertical columns on the table furthest from the dealer. Column bets pay out 2 to 1. Dozen Bet – A bet made on numbers 1-12, 12-24 or 24-36 which pays out 2 to 1. 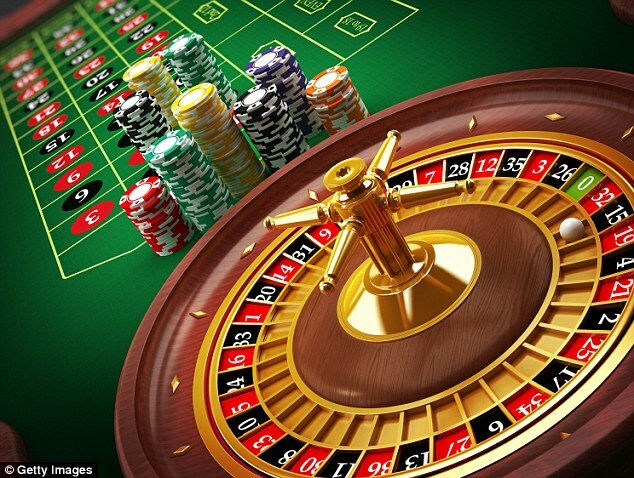 The most common betting systems used in roulette take advantage of even-money bets like red or black and odd or even. In this section we’ll cover the most common betting system that works with all even-money bets plus one special system designed specifically for the roulette table. Martingale System – This is really simple. First decide on a betting unit. A lot of people use the table minimum bet, so for this example let’s assume that’s $5. The martingale system says to start by betting one unit and then changing your next bet based on whether you win or lose the first spin. If you lose, double your next bet. If you win, keep betting the same amount. This system relies on the idea that the odds are against a long run of losing even-money bets, so chances are you’re going to recoup your losses by doubling your bet following losing spins. The downside is that even three or four losing bets in a row will force you to risk a lot just to get back to even. And since you’re not working with an infinite bankroll, a really bad run of losses could bust you. The James Bond System – This system is thought to have originated in the James Bond book series and the object is to make one bet and win enough money to buy a good dinner. The most common example calls for a total bet of $200 but that can be scaled up or down depending on your bankroll and how fancy a meal you’re aiming for.First put $140 on the high numbers (19-36), $50 on a line bet covering 13-18 and $10 on zero. If the number lands on a number in the high half of the board you’ll make a profit of $80. If the number is 13-18 you’ll make a profit of $100 and if a zero hits you’ll profit $160. If the ball lands on 1-12 you’ll lose your entire bet.